Do you want to know the secret to perfect living? What if we can awaken all the secrets to dissolving our struggles, fears, confusion, procrastination, for example? What if we can bridge the subconscious and conscious minds? In this new science of “push-button living,” the master switch-word is unsurprisingly Together. This switch-word led to a week of perfect bliss for James Mangan, and inspired him to uncover the other switch-word to bridge the subconscious and conscious minds. Apartness is obvious in its extreme forms, when someone literally comes undone, coming apart at the seams. A maniacal outburst. A meltdown. Flying off the handle. When that happens, a person feels sicker. Most of us live without giving any credit or voice to the subconscious, ignoring the subterrain of the subconscious and the powerful role it plays in our lives. In this way, we are deepening this chasm between the conscious and subconscious, the two selves that Goethe has written as warring parties. While many people may feel the conscious self is in control, it is not true. In the iceberg analogy, as with the tip of the iceberg, the only part visible is the conscious. The vast subconscious is submerged. Based on the density of ice and salt water, 10% of the iceberg is above the water’s surface. How much is conscious depends on the person. We have all heard the saying, “we are our worst enemy.” Without knowing it, we all self-sabotage, out of fear of being rejected and out of fear of the magnificent beings that we are. Some of our fears are obvious; most are not. We cannot befriend and move beyond to fearlessness if we are unaware of the real barriers. The Saboteur, according to Caroline Myss, is one of the four archetypes of survival. Understanding and working with them is paramount to a healthy psyche. When we bridge the subconscious and conscious minds, we are in a state of union and “absolute togetherness”. Here the “we” of the conscious and subconscious work together for the whole person. This is togetherness. We can go from apartness to togetherness. The subtitle of James Mangan’s book is How to Set into Motion Tremendous “Sleeping Powers” That Can Bring You All the Good Things of Life as if by Magic.” What are these “sleeping powers”? Awaken to this startling news: You are the sovereign superintendent of a vast, immeasurable domain that holds the secret of a perfect life, the fulfilment of all your needs and wants, the true destiny of your whole personality. The subconscious has perfect memory so even if the conscious mind does not register where we dropped our keys or put down our eyeglasses, the subconscious does. The more we strain to remember, the more slippery the information becomes and later in the day, seemingly out of the blue, we remember where we last put down what we thought we had lost. The switch word for finding “lost” items is “Reach”. James Mangan sees the subconscious/subsurface as an underground factory, not only for our natural needs such as the automatic functions of the body (breathing, digestion, etc) and also for our desires. Shaped by our experience, full of “unknown skills and amazing cleverness” there are countless machines just waiting to do the work. “Together”, the master switch-word that led to boundless rapture for James Mangan, turns on the entire factory and all the machines, each “custom built either to eliminate a specific distress or achieve a specific desire.” The most unused? According to James Mangan, it’s the fear-dispelling machinery. Alas, “they are rusty, out of alignment, sprung by neglect and disuse.” While James Mangan calls the results “as if by magic”, this rehabilitation process will take time, belief, and experiment, and also adventure and fun. In Chapter 20 of his book titled “The Mind-Machines in Action” James Mangan reminds the reader that four conditions are required – submission to Self-Union, objective and want, belief, and the Switch. Switch-words are one-word affirmations or mantras, designed to access the subconscious. They bypass the conscious mind, which is full of linear and rational arguments about why it cannot be. Switch-words is a device to invite the cooperation of the subconscious. It is an accessible way to bridge the subconscious and conscious minds so they can work in unison. The best way to know if switch-words work is to experiment with them, test them out. Try them without attachment and do not link their meaning to your desire. It’s important not to think of what the word means in their usual definitions in our common language. True need or want must also be present. Oftentimes we believe we need or want something. That’s usually the conscious mind, the ego-mind. That’s the small ‘s’ self that by nature is limited. The ego-mind is limited by time, form, labels, and cause-effect. The subconscious has other ideas because it contains the truth of experience and so conflicts arise. According to the book, of the 1000 experiments carried out with the switch-word “Change” for pain, 200 reported success. Why did 800 fail? Want and belief were missing. The missing link is not oftentimes known, as the subconscious is a deep mine. 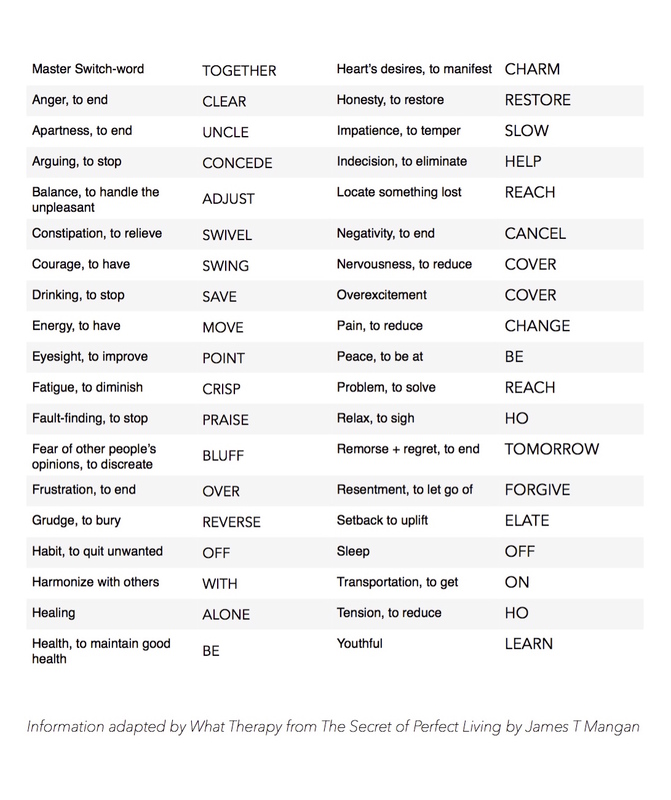 Below is a list of James Mangan’s switch-words that may help to improve health and wellbeing. The proof is in the pudding – try them out and let us know. You can download this switch-word list for health and well-being and print it out so you can use them often. If in doubt, “Together” can be the default switch-word to use to bridge the subconscious and conscious minds. The more you use these switch-words the more you will also uncover more of yourself. The more you work with turning on the links in the subconscious, you will find that the master switch-word is the only one you will need. ..for Perfect Living, once understood, is as free as time and as handy as fresh air. All mankind can share in it to the hilt. Some other causes the author includes are – inherited, picked up from the family environment, copied from others, the media, and the law of averages. All quotes were taken from James T Mangan’s book The Secret of Perfect Living.